I mentioned in my last post that I was working on putting together a few more Valentines cards using some non-traditional color combos. I had so much fun making these cards. The interesting thing is that the idea for both of these cards danced around in my head for a few days before I actually made them. I just love that part of the creative process. Even when I laid down to sleep at night I would envision how the cards might turn out, the colors I would use and the elements I would include. When an idea comes to me in this way, mulling it over and working it out for a few days, I always enjoy the process of actually creating the card so much more than when I just sit down at my workspace and try to throw something together on a whim. Of course, when I set about creating these particular cards they still took on a life of their own and became something just a little bit different than I had envisioned. 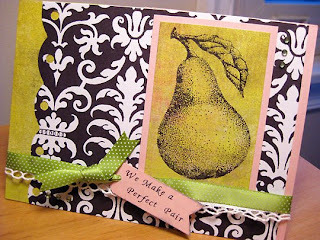 But that's OK too, because when it comes to card making, at least for me, it's all about the process of discovery. Truly beautiful cards...both of these! Thank you for sharing them and for your sweet comment on my blog. Fabulous color combinations. I feel like I sometimes have more fun planning the project rather than the actual execution of the project. Not alone in that! What lovely cards you make. 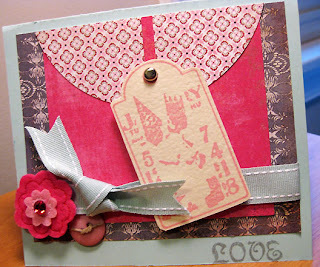 I love the pink tag one especially, it looks so cute with the felt flowers. "Beautiful Style Stars of the First Magnitude"